Congratulations to Anna and Panda for a safe return home. 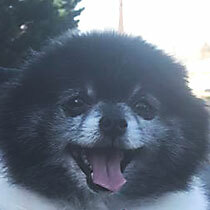 Panda went missing from Perryville, Maryland. It was not known if he had been stolen or was lost in the area. The Dogs Finding Dogs search team went out to track and was following Panda’s paw prints and scent. While talking with DFD, Anna and our tracker quickly posted Panda’s flyer on Facebook. Immediately, a neighbor saw the flyer and called them. They were only a couple of blocks from their location, and Panda is now reunited with Anna! So glad this little one is home! What a very happy reunion!